Prime Minister says Khameini’s hate shows the ‘real Iran,’ and vows that Iran will not have nuclear weapons. 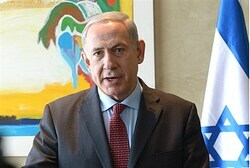 Iran must not obtain nuclear weapons – and Israel will not allow it to do so, Prime Minister Binyamin Netanyahu declared Thursday, speaking to Russian Jewish community leaders in Moscow. “They must not have nuclear weapons. And I promise you that they will not have nuclear weapons,” Netanyahu declared. “The Iranians deny our past and repeat their commitment to wipe the State of Israel off the map. This reminds us of the dark regimes of the past that plotted against us first and then against all of humanity,” he said. Netanyahu said that Iran is trying to change its image, and warned the world not to be fooled. “They are also using propaganda: They are now creating a propaganda film in which hears a piano being played, and sees the Foreign Minister going through a building, talking about the need for peace in the future. This is not the real Iran,” he said. Netanyahu has been outspoken in warning Western powers against reaching a “bad deal” with Iran that would allow it to remain on the verge of nuclear capability. He is currently in Russia as part of a last-minute bid to sway an emerging deal. According to recent reports, Israeli leaders are not relying on diplomacy alone, and are also working alongside Arab leaders on a plan to attack Iran if its deal with the West fails to yield serious change. Several Israeli leaders have stated that Israel could act alone on Iran. 'Obama and Ghattas both aided the terrorists' MK Oren Hazan says President Obama and MK Ghattas both aided terrorists at the UN and in Israeli prisons, respectively. Senate approves missile defense aid for Israel Senate passes defense policy bill which includes more than $600 million for missile defense cooperation with Israel.